Spring is in the air, obviously, and now’s the time to take advantage of fresh, plentiful ingredients! Any salad, in my opinion, can easily be doctored up to become a super tasty and satisfying meal. Below, seven of my favorite salad recipes! This chilled salad features a homemade sesame ginger vinaigrette plus low-carb noodles and tons of veggies. It can easily be made ahead of time, too, and can be served on a bed of spinach when you're ready to eat. This salad can be served warm or cold and is tossed in a delicious homemade Dijon vinaigrette. French green beans, new potatoes and boiled eggs make more a seriously hearty combo! This is easily one of my all-time favorite salads. 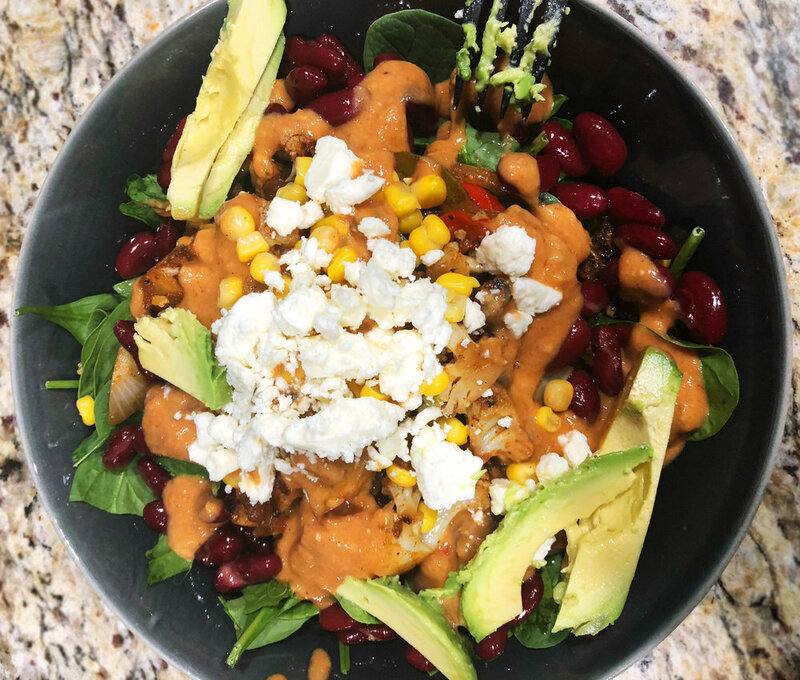 The simple dressing is made with a mixture of hummus, salsa, Chipotle Tabasco sauce and olive oil and packs a truly satisfying punch. This flavorful salad is loaded with fresh veggies and crunchy roasted chickpeas and is tossed in a creamy, low-fat avocado ranch dressing. It may be a salad, but it’s packed full with protein and healthy fats and is such a filling, satisfying meal! This super unique salad is loaded up with tasty toppings like spaghetti squash and roasted Brussels sprouts and is tossed in my favorite homemade dressing of all time: horseradish vinaigrette. Taco salad is one of those meals that’s reserved for days when you don’t really feel like cooking, but you know you shouldn’t order Postmates yet again. I spruced this everyday taco salad up with two special elements—a homemade honey chipotle vinaigrette and pickled relish! This mega-loaded modern Greek Salad features romaine lettuce tossed in Zoe's Kitchen's Greek dressing and is topped with diced red onions, red cabbage, shredded carrots, pepperoncinis, kalamata olives, feta cheese and oven-roasted chickpeas.